This Week In Running’s trail and ultra recap for January 21, 2019. Results from the 2019 Vibram Hong Kong 100k. 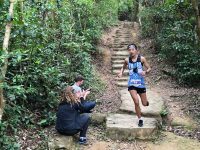 A video interview (with transcript) with Fuzhao Xiang after her second-place finish at the 2019 Vibram Hong Kong 100k.